Sinewy leaving, I love that. I first took “leaving” to mean “foliage” — as if the cocoon was covered with leaves, a strange way to read it — of course it’s the participle — but the image of muscular leaves wrapping a chrysalis was oddly compelling to me. Was it supposed to arise, or is that only my aberration? Either way, I love the phrase, and the poem. And the image. Nice! Now you’ve got me cross-indexing and imagining enfolded metaphors! I like your reading very much, thank you. IF a poem SEES with words what we seldom can envision with our eyes…then this be it. Good to see you here, Brenda! Very nicely done. And the picture is thought-provoking on its own. this exquisitly written poem reminds me that all beings who are interested in growth break free into a brand new realm only to find that sooner or later we must break free again. may your path lead you on to freedom. the imagery in your writing is very vivid. Rudolph, when you see a shed skin on the ground, perhaps caught on a rock or bush, you can only wonder what it felt like to escape from its confines. Thanks! Thank you, Nancy. I like to combine images and words, but each should be able to stand on its own. They translate each other, and like any translation tend to privelege some interpretations over others – like, would the poem be as clearly about a snake shedding its skin without the painting? Would its range of possible meanings have been greater? These are difficult questions. For me it comes down to working with the central image I have. I wrote the poem in part thinking about that painting and never thought I’d find the photograph admidst the plethora of storage boxes we moved last week. I’m glad you liked the painting! Ah, yes, Kerwyn. That’s a good point. It does seem we’re always transforming towards freedom; especially inner freedom. The cycle of realizing we’ve outgrown where we are and need to “break free into a brand new realm” is exciting in itself, if a little demanding sometimes! This and the rest of the poem, really, is my favorite part. I love how well you “do” molting. It’s a theme, indeed. “Papery,” “battle,” “sinewy,” “ripped.” Your physical, almost primal bits of description are your most powerful. I do like this~very much indeed. It is total emergence in quiet prose~alive~yet very, very simple in a Truth~the Act of Creation~the Act of rebirth~or birth, alone. Ethereal, almost. One reads it once; one reads it twice and even thrice~~and images go deeper within the mind and spirit. Laurieglynn, I’m so glad you came by, came out of Helias and came by. A rebirth certainly, that’s a good way to put it. 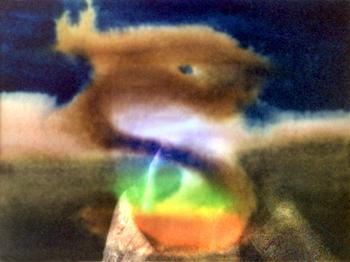 That image, perhaps the earth spirit rising, or kundalini out of vivid chakra colours. But the papery mass, that’s the parchment of which we speak, surely. When I paint especially because I cannot ‘redo,’ but also with writing, I struggle ‘to do’ (‘being’ so much easier) and it always feels like it takes a bit of my soul; or a bit of my soul gets caught/dwells in, whatever I manage ‘to do.’ I don’t find creativity an easy, pleasant thing at all; rather, the opposite. Burning with passion and torment until spent. Until released of the pressure ‘to do.’ Then one can slip back into placid ‘being.’ (I’m grinning!) Thank you, my dear friend. I liked this the first time and I like it again. Molting…birthing…so many ways to read these vivid words. I love the poem. I’m especailly drawn to the image of shedding – leaving behind tangible evidence of the old when you grow into the “new” skin, with all the scars and stretches that accompany the periods of growth and change that occur in every life. MB, I remember your comment before I put it in draft mode so I could submit it here, and it made me smile, so a double thanks! Probably I should mention that the technorati tag poem is mostly composed of lines edited out of the original version of the poem. And a little spoof on technorati, always some humour. fantastic poem. working on an architectural project. this imagery and words gives one much to work from and with. thank you. especially love the inuit language..how is that enunciated? I shall have to speak it at a gathering. doubtful I have any genetic lineal history to that language or culture..for me, speaking abenaki awakens the dormant meme and my own remembrance of my cell-f is enhanced..
Rebecca, currently I am living in a very cramped and tiny apartment and feeling most constricted. That was what inspired this little poem. An architectural project! I’d love to hear more. Stunning. I listened to the recording before reading the text and had first heard it as two poems — but as the tags progressed they began to meld in tone back into the opening lines. A circling about. Well done, indeed, Brenda. I particularly like your reading of this poem. Elissa, that’s a nice image of circling – I’m glad it worked for you! It was a new sense of recording for me in that I think I entered into the poem and spoke it from the inside, a bit scary and somehow exhilirating, hard to explain. The style of reading the tag poem contrasted, or so I felt. But they ouroboros-tailed into each other (perhaps!). Interesting how your recording gave me a different feel for it. Not a different meaning, particularly, but is pushed the emotional cast of it to a particular slant I hadn’t experienced before. Nicely done! Oh, Brenda, so much tactile, visual movement; it’s loaded.